Mad Dog & Beans, a new eatery in Brooklyn, has found inspiration in the Mexican Revolution to peddle upscale Mexican food to a local crowd. The eatery, first spotted by a non-Mexican colleague of mine, features on its door the image of a bandito holding a guitar, because even Mexican outlaws are a musical, cheerful bunch. 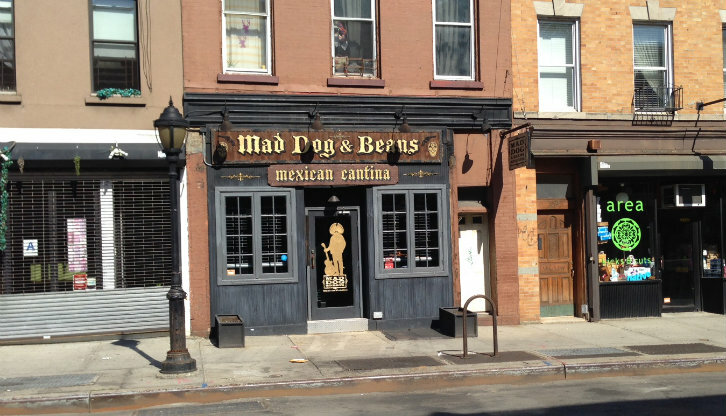 Mad Dog & Beans Mexican Cantina is a casual-upscale Mexican restaurant featuring a traditional Mexican menu. The theme is based on the Mexican Revolution. The decor features vintage black-and-white photos of banditos and scenes of Mexico printed on canvas and displayed throughout the restaurant. This entry was posted in Food, Guacala, Mexico, New York City and tagged Brooklyn, Hispanic, Mexican Food, stereotypes. Bookmark the permalink.